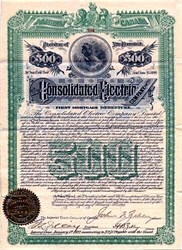 Beautiful certificate from the Consolidated Electric Company dated in 1892. 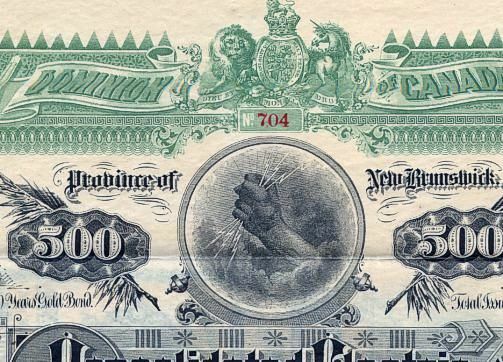 This historic document was printed by Homer Lee Banknote Company and has an ornate border around it with a vignette of a hand holding a lightning bolt. This item has the signatures of the Company's President, John F. Zebley and Secretary, H. B. Zedley and is over 117 years old. 55 coupons attached on right side. In Canada, by 1890, some electric lines had been established for as long as five years. The Saint John City Railway Company had anticipated possible future use of electric traction early as 1887, and received specific legislative permission in 1890 to electrify its lines. In the same year, two companies, The New Brunswick Electric Company, and the Eastern Electric Company, were chartered for the purpose of supplying electric light and power to Saint John. These companies were allied with the management of the street railway, but were not directly connected with it until 1892. On January 18th of that year, a new company, The Consolidated Electric Company, was incorporated, acquiring all the assets of both power companies as well as the Saint John City Railway Company. The Consolidated Electric Company announced immediate plans to electrify and extend the street railway system in Saint John, including constructing the King Street route, and sought permission in the form of an act of the Provincial Legislature. The act was passed on April 7th 1892, giving the company full privileges to operate an electric street railway in Saint John. It took the rest of 1892 to plan and raise the money for electrification. Six electric horse cars were bought from the West End Street Railway of Boston, Massachusetts, and poles and trolley wire erected. The flat horsecar rails were hastily bonded and a copper ground wire was laid between the rails and connected to them at intervals. In places the only connection was made by a spike tightly driven in between the rail ends. Papers announced that spring as conversion neared completion, "The electric surface railway is soon to be a reality, and the cry of the motorman will be heard in the land". There were many skeptics who predicted serious effects of the high speeds of up to 25 miles an hour and the nerve racking noise and well as the danger of electrocution from falling wires.